Bonnie Knopf is all heart, a compassionate Christian who gives voice to those who are on a spiritual journey. She seeks not so much to admonish but to lift, to lighten the burden of those seeking His heart. She sings about "picking up Tonka Trucks, Barbie dolls and dirty socks off the floor, the pain of broken friendships and finding peaceful moments in a chaotic world," quotes Robin Franzen, Gresham Outlook newspaper. 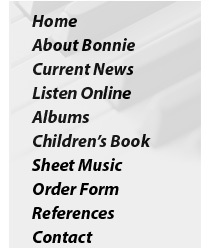 Since 1986, Bonnie has released six albums. "Treasures," "Every Moment," "Close to His Heart," "Heart of Worship," "Crossroads," "A Mother's Touch," and a new children's book, "As I Kneel" which also has a companion cassette of the song "As I Kneel" as well as the book reading. Reviewers describe the recordings as "giving one the feel of dipping into the prayer journal of one who is recording the issues and spiritual discoveries of her life. There's nothing pretentious or contrived; simple scripturally based songs straight from the heart . . . very powerful. Her warm clear voice will coax you into God's presence." Bonnie learned to play the piano as a child and wrote her first song at the age of 8. "It was a pivotal event in my life when early on I recognized the difference between just playing someone else's music and being able to close off everything else and see what's inside of me, in the center of my heart, and write about that." While attending Portland State University, she sang with the Norman Leyden Singers of the Oregon Symphony. "Music has always been a passion for me. It's part of my makeup emotionally." Bonnie, a mother of three, who lives on a 26 acre farm in Troutdale, Oregon, has strong feelings about the importance of family relationships. She is often the vocalist for annual conventions of Mothers of Preschoolers, a 73,000 member international support organization. "Mothering matters. It's worth it! We have a greater impact on our kids than anyone else will. I want my music to affirm women and men who are committed to the health of their families." Besides her involvement with M.O.P.S. International, Bonnie is also a requested solo performer and worship leader for conferences around the country. Bonnie's main objective in her music, is to provide an opportunity to experience a connectedness with God. To know that we are not alone in our struggles, but to experience a loving, and compassionate God, who walks with us in the midst of our journey.